Flowers are good, but romantic getaways are better. Even though Valentine’s Day falls on a Thursday this year, you can still take your significant other on a romantic getaway the following weekend at one of these romantic retreats. Wine and dine your valentine and then simply drift upstairs. And for those times when the “privacy” sign isn’t hung on your door knob, we’ve included activities and nearby destinations to explore. Live like royalty in this AAA Five-Diamond hotel in Pennsylvania’s largest city, Philadelphia. The perfect Center City location of the Rittenhouse makes you feel, as they put it, “like being given a key to the city.” While you’re out comparing cheesesteaks and ringing the Liberty Bell, you and your sweetheart can come back to the exquisite Rittenhouse for a romantic night in. Make sure you save time for the delicious Sunday Brunch at Lacroix, one of the Rittenhouse’s gourmet restaurants. Relish in the Goat Cheese-Mascarpone and Rhubarb Croissant or the Singapore Chill Crab dish, all prepared for you by renowned Executive Chef Jon Cichon. 210 W Rittenhouse Square, Philadelphia, PA 19103. Phone: 215-546-9000. rittenhousehotel.com. Driving time from Harrisburg: 1 hr., 48 mins. At this AAA Four-Diamond hotel, couples delight in the sophistication and comfort of the spot, while also embracing the novelty of the Hotel Hershey. Try the “Everything Chocolate” spa package to revel in the dessert that makes Hershey so famous. You’ll soak in a Whipped Cocoa Bath, revive your skin in a Chocolate Fondue Wrap, and relax in a Cocoa Massage. Channel all your willpower into not eating any of the treatment. 100 Hotel Rd, Hershey, PA 17033. 717-533-2171. thehotelhershey.com. Driving time from Harrisburg: 23 mins. Previously the home of U.S. Army General Bruce Kendall, this B&B now serves as a peaceful 7,000-acre getaway in Pennsylvania’s Lebanon Valley. Tucked into the gorgeous Blue Mountains and surrounded by lush farmlands, the Annville is calling you for a romantic weekend away from the stresses of daily life. The Annville Inn is so inherently romantic, in fact, that it has several romantic packages for couples. Try the “Gourmet Picnic & Wine Trail” Package for a delicious picnic packed by the Innkeeper to enjoy while you and your sweetie visit nearby wineries. Or to explore the town, consider the “Ultimate Romance” Package, which comes with two movie tickets to the famous 1920s Allen Theater, a bouquet of season flowers, decadent local chocolates, and a romantic dinner for two at one of the restaurants in town. 4515 Hill Church Rd, Annville, PA 17003. 717-867-1991.annvilleinn.com. Driving time from Harrisburg: 37 mins. Visit this historical gem in the heart of Cumberland Valley to capture the essence of relaxation and rejuvenation. 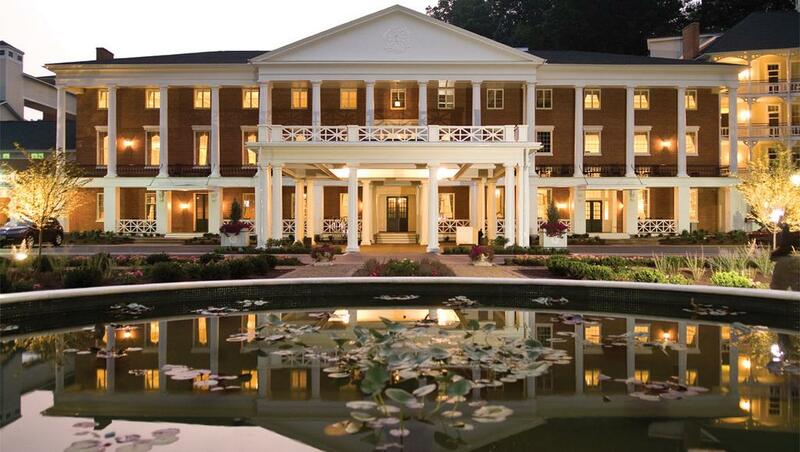 Established over 200 years ago, the Omni in Bedford Springs has been a mecca for luxurious leisure since its beginning. Romance” Package, inclusive with $100 cuisine and cocktail credit, a bottle of champagne delivered upon arrival, and romantic turndown service. 2138 Business 220, Bedford, Pennsylvania 15522. 814-623-8100. www.omnihotels.com. Driving time from Harrisburg: 1 hr., 54 mins. Explore Pennsylvania’s Dutch heritage in the Amish Country at the Inn at Leola Village. Slow down and take some time to smell the roses at this bed and breakfast that has been converted from its 1800s origin as a tobacco farm into Pennsylvania’s only historic hotel with AAA’s Five-Diamond Award. With Tuscan-style room furnishings, historic charm, double whirlpool tubs in the guest rooms, and complementary European style breakfast, it’s no wonder Forbes Travel named stamped its approval on the Inn at Leola Village in 2016. For extra romance in the Pennsylvania countryside, request a suite with a fireplace or the private and cozy Ada Fisher Cottage. If that’s not enough for your love-cation, the Inn offers a “Couples Pampering” Package, welcoming you with a bottle of Champagne, gourmet dinner for two, and a 50-minute full body couple’s massage. 38 Deborah Drive Route 23, Leola, PA17540. 877-669-5094. theinnatleolavillage.com. Driving time from Harrisburg: 59 mins. Battlefield Bed and Breakfast Inn has the ideal amenities, location, and rooms for a romantic getaway. A beautiful setting on the Historic Gettysburg Battlefield get cozy around a gas fireplace in the Graham’s Artillery or General Merritt’s Suite rooms. Take a long soothing bath in a double soaking tub in either the Anna’s Garden or Houghtelin’s Hideaway rooms. Enjoy the gas fireplaces in the spacious common rooms with your sweetheart. Request the Romance in Gettysburg Package which includes a sparkling beverage and fresh, delicious chocolate-dipped strawberries waiting in your room when you arrive. Only minutes away from downtown Gettysburg and the Gettysburg National Military Park. Fun winter attractions such as Liberty Mountain and the Outlet Shoppes at Gettysburg are also within a short commute from the Inn. Dog friendly with no restrictions on breed or size. No pet fee. 2264 Emmitsburg Road, Gettysburg, PA 17325. 717-334-8804. gettysburgbattlefield.com. Driving time from Harrisburg: 47 mins.